When your little one is ready to walk, it’s time to get them their first baby shoes. Shoes are a necessity for outdoor safety and sanitary reasons. As you’re shopping for shoes for infants learning to walk, keep in mind a number of important features. The shoes should be roomy with good flexibility, have non-skid soles, and breathable. We addressed these alongside other features when coming up with 10 of the best shoes for babies learning to walk. Recommendation: One of the best shoes for babies learning to walk are these Canvas Sneaker Shoes from Itaar. They’re soft and flexible so babies are comfortable, and the rubber soles are great for safety. The Velcro straps make for easy putting on and taking off. The material isn’t exactly durable as it’s prone to fraying, and though they’re roomy, they don’t fit true to size. Recommendation: These cool looking sneakers for babies are made of canvas and come with comfortable rubber soles. They are very safe for babies, extremely soft and lightweight and very easy to put on and take off. They suit any style and any occasion, plus the anti-slip sole is very durable and will make your baby walk in them very natural. Recommendation: These walking shoes for infants are ideal when your baby is just getting used to moving on their own feet. They stay on well and offer a good deal of support thanks to the rubber sole. Though they don’t constrict your baby’s feet, the walking shoes can run too wide. Furthermore, they work well for colder weather but may get too warm in the summertime. Recommendation: With a sturdy sole, these shoes grip well on tricky surfaces, making them a good choice for outside use. They come in multiple colors as well, so you can match up with various outfits. Though the padded insole is nice, other features don’t make these comfortable for longtime use. They could use more flexibility since getting them on isn’t easy. Make sure your baby’s best walking shoes match the best socks. Recommendation: These are really some of the best shoes for babies learning to walk because they are super soft and comfortable so your baby is less inclined to try to remove them. Thanks to the thin sole, it gives kids just enough support without sacrificing their comfort. The overall quality could use some work as these can tear after a short amount of time. They also get dirty easily, but they clean off just as easy. Recommendation: Made using eco-friendly materials, these cute shoes are highly breathable to fight off sweat. The soles not only grip well, but they’re waterproof to withstand a variety of conditions. Though these are good baby shoes for first steps, they could still do with some better stability. Also, since they’re cotton, they get dirty easily and are a bit tough to clean. Recommendation: These baby walking shoes are available in a number of colors and designs so you can mix up your baby’s style. Though the leather material is sturdy, the decorations are a bit lower in quality as they can peel and come off. These are sized rather big, but it does give baby more room to grow in. Even still, with the strong elastic ankle, they mold better to your baby’s feet. You can also check out these fun walking toys for babies. Recommendation: These walking shoes for infants are made with super soft high-quality leather so they aren’t prone to wearing down anytime soon. They’re made well enough to help with balance and posture, and they are just thick enough to properly protect the feet. However, these baby moccasins tend to have a chemical-like odor that’s hard to air out. Also, the inserts aren’t attached and can come out. Get your baby the best baby leggings to wear with their shoes when they are learning how to walk. Recommendation: These Orgrimmar First Walkers are some of the best shoes for babies learning to walk thanks to them having a good anti-slip sole and being lightweight as to not weigh your baby down. They have enough maneuverability that those early walkers need as they develop balance and coordination. However, they could do with some more breathability and an easier way to get rid of strong odors. Recommendation: These adorably designed baby shoes are made out of quality leather that’s soft and comfortable. They are prone to scuffing though, so the longtime use of these shoes is questionable. They tend to run large, but fit well around the ankles, so they still stay on rather well. However, take care that the dye can potentially bleed through. Recommendation: Next in our search for the best shoes for babies learning to walk we have these high-quality moccasins from BirdRock Baby made of soft and durable leather. They are easy to put on and to keep on thanks to an elastic band that makes sure they stay on your baby’s feet. Also, they have a very flexible sole and are lightweight so your baby won’t have a hard time when wearing them. Moreover, if not satisfied with your purchase they have a 100% lifetime guarantee for return and replacement or complete refund. Recommendation: With the great ankle support for balance and preventing falls, these Stride Rite Booties are some of the best shoes for babies learning to walk. They have a secure fit to keep baby from taking them off. However, it can get too stiff at times. Coupled with them running narrow, buying a size up will help these last longer. 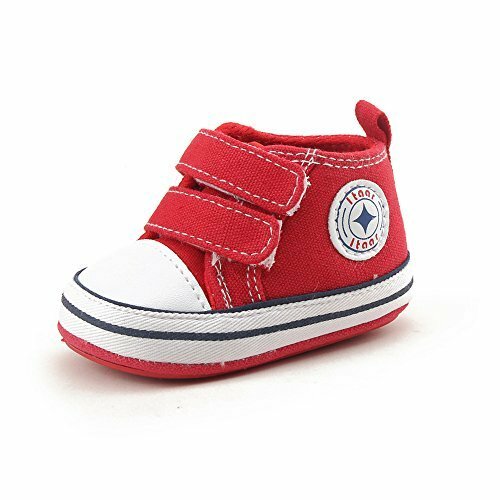 Baby shoes for first steps should be comfortable and offer enough protection and stability to get your babies off to a good start. We know our top 10 list will help you find the right pair for your little one. Know any other best shoes for babies learning to walk that we missed? Let us know in the comments.